I walked through the jungle for eight days, from Bario to Lioh Matoh. I stayed at longhouses. A fellow would guide me for a day or two, then pass me on to someone else who was going the way I wanted to go. 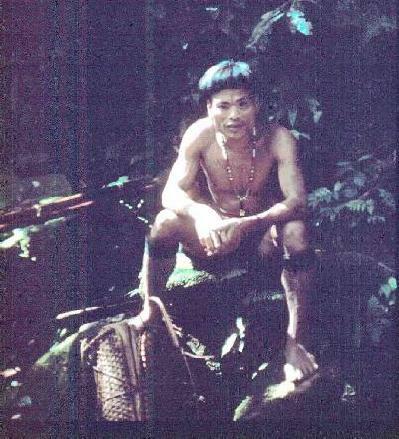 This gentleman is a Penan, one of the smaller tribes in Sarawak. They were hunter-gatherers at the time. I traveled with Penans some of the time, with Kelabits the rest. Both were unfailingly polite. I was using slide film at the time, and the jungle was thick. Most of my pictures of the hike didn't come out. This one is pretty grainy.